I S W Karunathilaka, inventor of a wave/wakeless boat design, recently won the inaugural Ray Award for excellence in innovation and enterprise in Sri Lanka. His invention, which saves fuel and protects river banks, would have wide ranging applications when developed to its full potential. It can also kick-start a long neglected mode of transport: using our numerous inland water bodies to move goods and people. 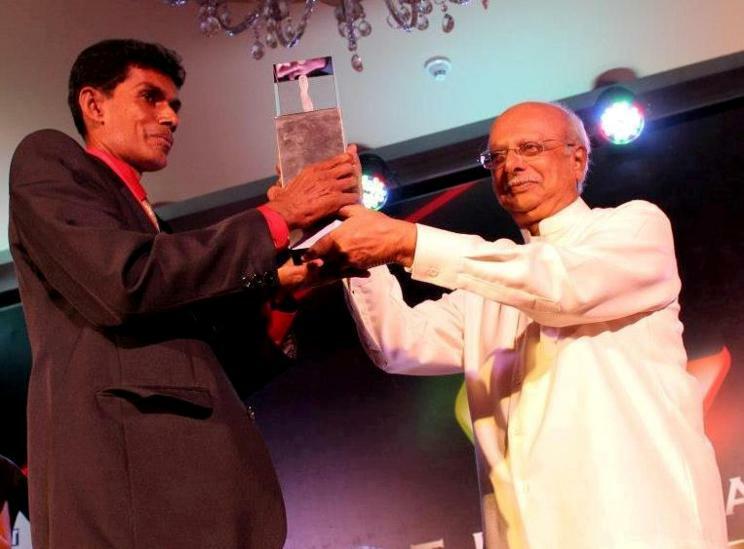 Karunathilaka, an accountant turned entrepreneur, received the Ray Award at a gala ceremony on 17 October 2012 in Colombo. The Commercial Bank, which sponsors the award, will provide a grant worth LKR 1 million (USD 7,710 approx) to assist him to advance his invention for commercialisation. The University of Moratuwa, meanwhile, will help with technical support. Six Lankan inventors, all of who had already won Presidential Awards for Innovation, were shortlisted for the new award. Coming from very different backgrounds, each had designed a practical solution to an everyday need. In the end, the independent panel – appointed by the Ray Wijewardene Charitable Trust – chose the proposal by Indre Sri Waidiyarathna (I S W) Karunathilaka to take his proven concept forward. The Ray Award is not for new inventions per se. Rather, it seeks to help an already state-recognised inventor to commercialise his or her invention. That’s where many good ideas often get stuck. Deepal Sooriyaarachchi, head of the Sri Lanka Inventors Commission and member of the selection panel, said candidates were all assessed on three criteria, or three ‘I’s: Invention, Innovation and Impact. The winning entry had impressed more than the rest. But just what is special about this improved boat design? Ancient Lankans have been water-faring for millennia. They also developed advanced traditions in designing and building ships, rafts, canoes, vallams and catamarans. That traditional boat building technology is well documented by researchers like Vini Vitharana, Somasiri Devendra and Gerhard Kapitan. For a long time, the V-shaped hull was part of the standard boat design, both here and elsewhere. That works fine when out at sea, but in narrow inland canals and fragile wetlands, such boats generate plenty of waves that erode banks. The damage is amplified when boats are fitted with motor engines. 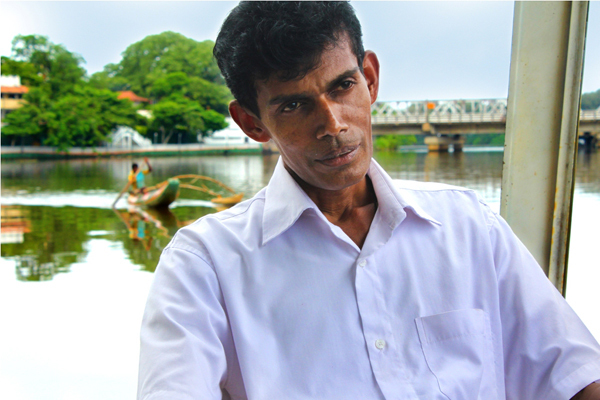 Karunathilaka has a family heritage in watercraft. His grandfather operated passenger and cargo ferries from 1915 to 1940 on the Kalu Ganga and other inland water bodies. But when he tried to revive the family business, Karunathilaka found that motor boats were no longer allowed — on environmental considerations to protect river banks. Undaunted, he set out to design a boat that didn’t have this effect. He studied how waves emerge and propagate, and experimented with various hull shapes to see which ones could allow wakeless and waveless motion. He worked with the National Engineering Research and Development Centre (NERD) of Sri Lanka. His models were tested at the Peradeniya University’s Faculty of Engineering that has a boat testing yard. After trying out various models and simulations, he came up with a boat design that is non-symmetric in shape: rectangular on the outside, but has curves facing the inside. It has twin hulls, which allow water to travel through the hollow mid section. By containing the wake within the craft, it prevents waves being formed on the boat’s outer sides as it moves. If the boat’s propeller is fitted in the middle of the boat, it further cuts down wave creation and reduces ripples even when travelling at high speeds. Karunathilaka was full of energy and enthusiasm when I spoke to him last week. When I first met him, three years ago, he was experimenting with a model that measured 40 inches by 12 inches (101.6 cm x 30.5 cm). I interviewed him on Siyatha TV, showcasing his work in progress and discussing its future potential. It’s heartening to see how he has come a long way since then. From early 2012, he has a full scale prototype doing test runs on the Kalu Ganga. Measuring 36 feet by 12 feet (11m x 3.7 m), it can carry up to 50 passengers or 4,000 kg of cargo. It was built with funding assistance from the National Science Foundation (NSF). While the prototype has passed the proof of concept stage, the design can be further improved, the inventor says. One factor is speed. The prototype cruises at around 8 kmph, and has a maximum speed of 10 kmph. While this is safe and stable, it’s a slow boat. So Karunathilaka has just designed a compact version, which has all the attributes of the larger one – and can carry six passengers on speeds up to 100 kmph. As a boat’s speed increases, so does resistance. To minimise this, he has fitted hydrofoils to the smaller craft. The boat will be just skimming water at higher speeds. At lower speeds, more of it will be immersed in the water. “My larger eco-boat is comparable to a bus, and this smaller one is like a car,” he says, envisaging an export market for this compact version. Both the large and small versions can have many uses: his vision extends beyond a ferry service. He sees potential in the tourist industry, where eco-friendly tourism is becoming a premium product. It can also help in rescue and relief operations at times of water related disasters. With the Ray Award, Karunathilaka plans to further improve his design – for example, to see if he can run it on bio energy with a small gasifier on board. “I’m still testing this, and trying to determine which source of biomass would work best – gliricidia or something else,” he says. He draws much inspiration from the renowned Lankan inventor Dr Ray Wijewardene in whose memory the Ray Award is presented. Ray popularised biomass gasification among industries and pioneered dendro power: burning fast-growing trees to generate electricity. “A century ago, many boats and even ships were driven on steam power. Any engine – whether two-stroke or four-stroke – can run on liquid petroleum (LP) gas. We must look into all these options,” Karunathilaka says. This boat is eco-friendly in other ways too. It consumes less fuel (petrol) as energy is not dissipated and wasted in wave generation. Unlike conventional boats made from fibre glass, this vessel is built with steel and aluminium, with an anodic protection which reduces corrosion. When such a boat reaches the end of its useful lifespan, components may be recycled. In his moment of glory, Karunathilaka acknowledges support received from family, friends and agencies like NSF and NERD Centre. He is especially grateful to Dr Tissa Vitarana, Senior Minister of Science, for grasping the significance of this concept early on (when some experts doubted it could work). Being an enterprising inventor, Karunathilaka knows the value of demonstration. Testing his craft on Kalu Ganga will continue, but he is also planning the smaller boat to be showcased on Colombo’s Beira Lake in the coming months. Now all we need is for the next James Bond movie to feature it! This entry was posted in Biofuels, Communicating Development, Energy Conservation, Environment, Green Economy, Innovation, Science Journalism, Sri Lanka, Sustainable Development, Water and tagged Deepal Sooriyaarachchi, eco-boat, I S W Karunathilaka, Indre Sri Waidiyarathna (I S W) Karunathilaka, Kalu Ganga, Presidential Awards for Innovation, Ray Award, Ray Wijewardene, river banks, Sri Lanka Inventors Commission, The Ray, University of Moratuwa, wakeless motion, water ways, wave/wakeless boat, waveless motion. Bookmark the permalink.